Coloring was interrupted by some recent busy-ness, but here it is in progress, with the final version to come when I’m able. You might notice that I edited the original doodle a little bit. The “tee-hee” guy just wasn’t working as well as the other t-shirted blokes. I scooted the fairy over a little to balance the void. 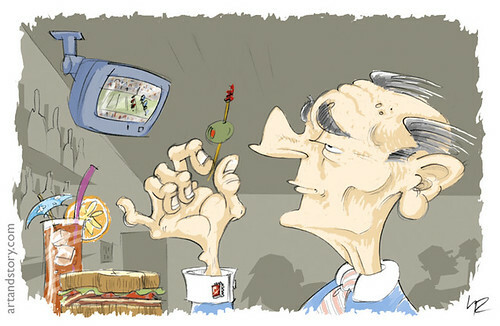 This is my illustration of Bill Murray in the role of Jacques Chirac for the new movie, Jacques In America. I heard that prosthetic nose required several hours in the make up chair each day. Read on to see earlier stages of this illustration. 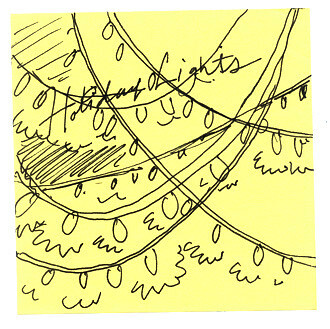 I’ve been holding back, but here now is more glorious ball-point pen on Post-Its. 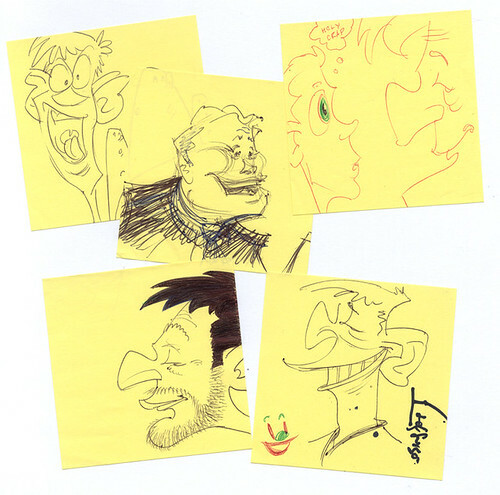 Some familiar schnozzes in profile. Three of them. And since they say three’s a crowd, then I suppose it can be a party, too. And since I did my drawing of Dave Letterman, I’ve periodically been trying my hand at Regis Philbin. He had been on the program that night, but I just couldn’t capture his likeness. You’d think he’d be easy, but I was surprised. Included above is my latest attempt. Still has a little ways to go to being recognizable. I think it looks more like a somewhat heavy-set Conan O’Brien doing his impression of Regis, but it’s a lot closer than my first attempts. When I saw this in the back-to-school section of the drug store, it instantly took me back to about 4th grade or so. An impulse buy to gratify the inner child. The Twist-Erase is my new favorite pencil! I do a lot of erasing and am annoyed by most brands’ way of using the eraser as a plug, so the design of this pencil is really ideal. Also, the quality of the eraser is superb. It yields a greater range of erasure from just a lightening of the line to a total clean erase and rarely ever smudges. Thanks, Pentel! Please don’t ever change this design or compromise the quality of this product. A nice thing about the drafting pencil as a sketch tool, is that it often doesn’t need to be sharpened. If drawing at an angle, the lead seems to keep itself sharp enough just rubbing against the paper. In fact, I’d say you get a more interesting point than one straight out of a sharpener, because it has a bit of bevel to it, so you can get a wider variation of lines. But when I do want that pristine point, as is pictured above, I use a lead pointer. Because you’re only sharpening the lead and not the wood, it’s much faster to sharpen one of these. You also don’t have to fuss with cheap sharpeners always breaking your lead because they can’t cut through the wood. 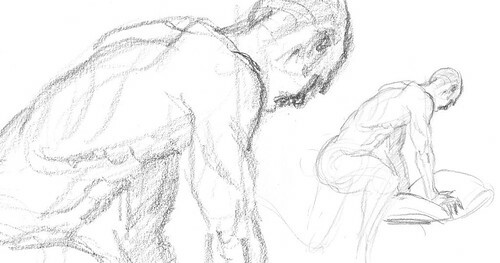 By the way, all of my recent life drawings posted here were drawn with this last pencil. April Figures: Dynamics, Part V of V! The last of the April Figures and Dynamics series, I promise. Then I’ve got a little stack of post-it doodles to post …it. 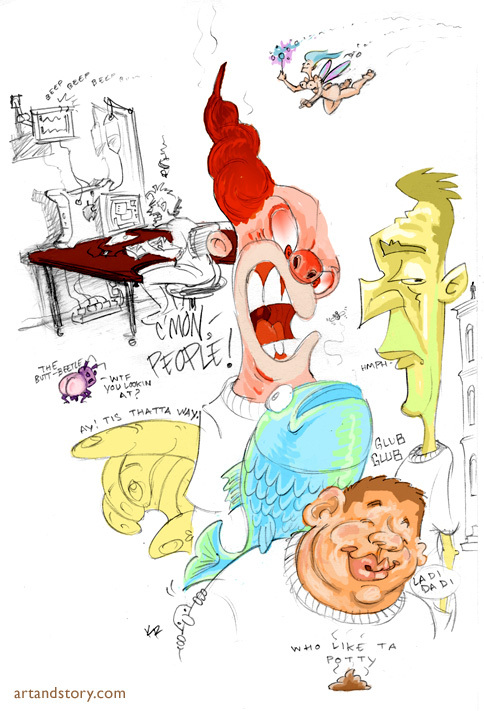 More of the whole image with detail(s). April Figures: Dynamics, Part IV of V? Still not done. 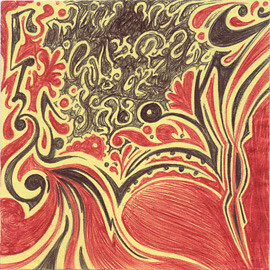 I think I should have one more post from the “Dynamics” series after this one. Here are a few more drawings of Clay from Karl Gnass’s drawing seminar. I tried something new with these images, giving you a full drawing and a detail of that drawing in each. I exaggerated things a little on this last one. April Figures: Dynamics, Part III of IV? Now here’s a hodge-podge. 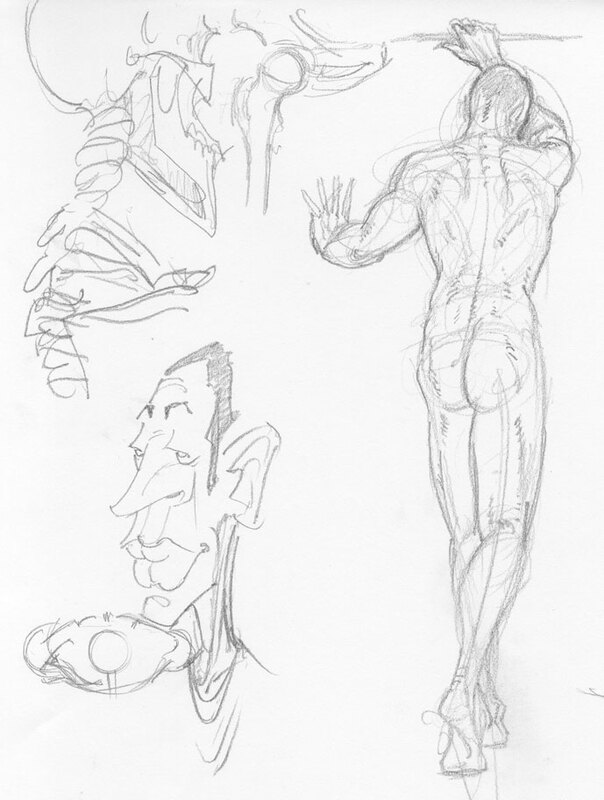 A quick sketch of the class skeleton, a character doodle, and some anatomy notes squeezed in, alongside a “serious” drawing of Clay. 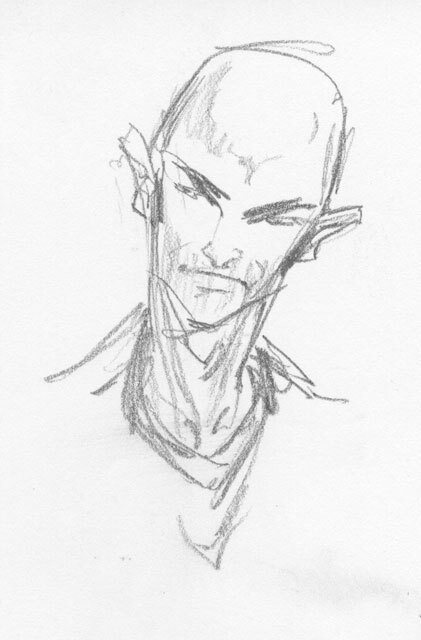 And a quick portrait sketch I sneaked in between taking notes from Karl. I did some color experimenting with one of the drawings from my previous post. A bit overworked, maybe, but I thought it worth the post. 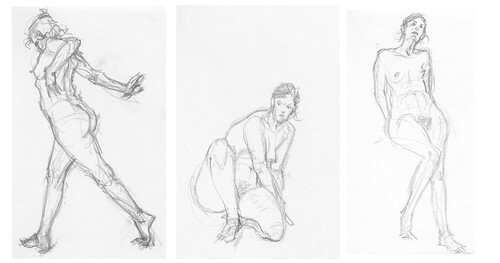 These are drawings I did in a day-long drawing seminar with Karl Gnass, titled Using the Force: Dynamics of the Figure. The dynamics we concentrated on were, as Karl explained, not the dynamics of Burne Hogarth, which are more about dynamic action poses and drawing the figure with lots of really well-developed muscles all working simultaneously. Perhaps if you’re drawing a superhero lifting a car or a locomotive, it might be appropriate for every muscle to be engaged, but for anyone else you might draw who isn’t a superhero, it’s an unnatural and, in several respects, non-dynamic way of portraying the figure. Karl defines dynamics as opposing forces working together. So, for example, if you are reaching up with your right arm, your left arm is hanging down and your feet are pushing into the floor. Some muscles are stretching and pulling and others are dropped or relaxed. There is a push and pull, a give and take in the body. The dynamics reveal themselves in the anatomical elements, or stage 3 as described previously — in the muscles, bones, and joints — and so we concentrated a bit more on those elements in this seminar. 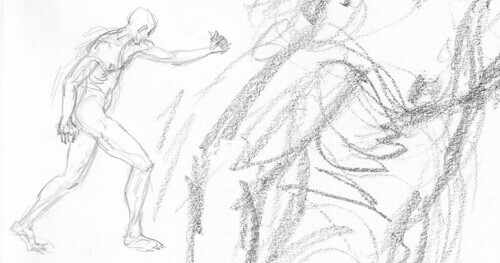 Attention was still given to the first two stages — gesture (which gives you vitality) and conceptual forms (building a 3-D model of the action, not a stiff) — and their importance in describing the dynamics of the figure, as well. 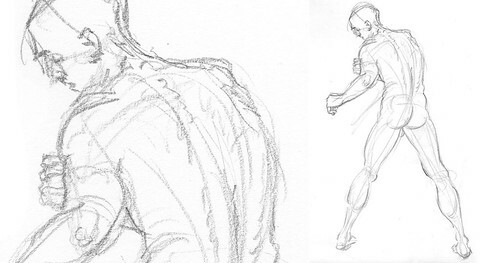 These were drawn when I sat in on one of Karl’s evening painting classes and so it was quite a long pose. It had been a while since I’d had this much time with one pose, so I had a little fun getting into the superficial details. I’m referring to the one on the left, of course. 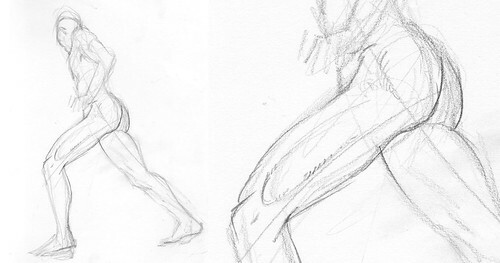 The one on the right, I drew just in the last few minutes of the same pose and from a different angle. It’s perhaps not as pretty a picture — it doesn’t have those dramatic cast shadows or the weight of the first — but it may just be a more successful study of gestural, three-dimensional, and anatomical form. 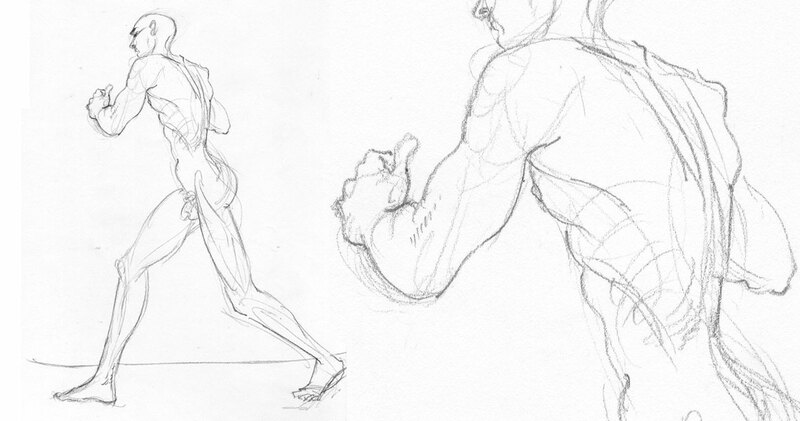 It’s been a while since I’ve posted some figure drawings. There are a lot of them, so I’ll post them in increments. Here’s the first batch. I think all of these are from April. 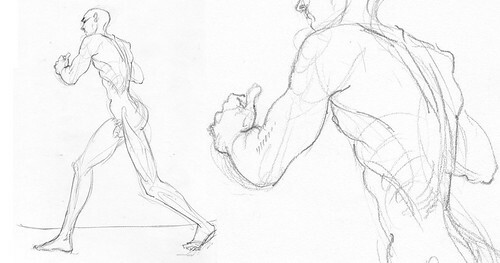 The above drawings were short poses, I’m not sure how long, from Karl Gnass’s class. Karl teaches us to concentrate on three main levels in drawing the figure. There are more levels beyond these three and of course, more that is involved with just these three, but these are the main ones, and the ones we start out with. They are three aspects of drawing the figure that we may examine separately or simultaneously. However, if we separate them and move through our drawing in the order of these three stages, we can begin to pinpoint our weaknesses. The goal in the end, I think, is to have each of these three support the other. You should not have anatomy which does not reinforce the gesture or help tell the story, or anatomy that does not describe volume or three-dimensional form, for example. I found, in examining these stages, that I wanted to skip over the second stage. I didn’t like conceptualizing the forms of the figure into cones and cylinders, etc.. I felt like I was turning the model into a mannequin and anyway, I knew I could draw well enough to get those nice curves of the anatomy. Why mess around with this kid stuff? Well, what I realized was that although I understood a fair amount of the 3-dimensional forms in front of me, how they took up space, that’s not what I was drawing. Or rather, that is what I was drawing, but that’s not what I was communicating. I relied very heavily on the contour — the outline shape of things — and on duplicating those details, albeit in a stylized fashion, which seemed to be describing the form in front of me. Perhaps ironically, simply drawing what is in front of you is not the best way of describing what is in front of you. Now, to be honest, I did have some capacity to describe the 3D forms of things, but I was pretty lazy about it, really. So, I am continuing to try and develop my skills of “drawing in the round.” I still think I have a tendancy to fall back on my old ways of seeing the figure and it’s a constant struggle to see in a new way, but more and more when I look at my drawings, I’m seeing little things that I don’t think were there before. That’s exciting. And at the same time, there is a little nagging part of me that seems to mourn the old comfortable way of working. Growing pains.